The Model SPC/L311 is an in-line or tank vessel viscometer that is installed in process fluids to provide continuous temperature and viscosity tracking. Our technology is based on simple and reliable electromagnetic concept. Two coils move the piston back and forth magnetically at a constant force. Proprietary circuitry analyzes the piston’s two-way travel time to measure absolute viscosity. 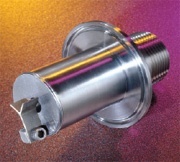 The Model SPC/L311 has a quick connect disconnect Tri-Clover® flange. Typical systems include a tee, Tri-Clamp® and an application specific gasket.